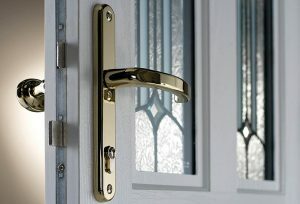 You are here: Home / What Are Composite Doors and How Much Do They Cost? So, what exactly is a composite door? Different, clearly, to a timber door and also a uPVC door in that the door surface is made from GRP. This is the same material that modern speedboat hulls are made from, so its really strong and durable. The door is clad in coloured GRP and the centre or core is a energy saving dense solidified foam or otherwise a timber core. The whole door & frame is reinforced to give it even more strength . Composite doors are renown for their ability to appear as if they are made from timber by making us of a very detailed wood grain effect surface. The colour range is also extensive so you can match almost very type of home style.